Sign up Now -- 3-day training seminar -- plenty of hands-on! Familiarity with system administration and configuration of Windows Server 2003. This training seminar is not meant as an examine prep but does cover most of the same skills tested on Exam 70-284. See the table below for an exact correlation. 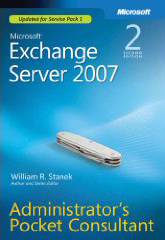 Note that Exam 70-284 covers Exchange Server 2003, a new exam will be created for Exchange Server 2007 with a very similar skills matrix. ©William R. Stanek 2004-2007. All Rights Reserved.